As all the preconfigured 45BC KEMARs consist of the same basic 45BC KEMAR Non-configured, plus a set of application specific accessories, the full information about a given KEMAR configuration is obtained by combining the information about the 45BC KEMAR Non-configured and the information for a given configured version as found in the present text. Read about the non-configured KEMAR here. The 45BC-12 is a KEMAR with mouth simulator, anthropometric pinnae and low-noise ear simulators for 2-channel low-noise headset test. It is delivered fully configured, individually calibrated and ready for use. In addition to a system calibration certificate, a USB flash memory with simulation data is included. The accessories specific for this configuration are listed in the Ordering Info tab. The main configuration specific components of the 45BC-12 are the GRAS 44AA Mouth Simulator, the GRAS 43BB Low-noise Ear Simulator System and the KB5000/KB5001 anthropometric pinnae. The maximum continuous signal the mouth can produce in 1/3-octave bands is 100dB re. 20µPa in the frequency range 100Hz to 16kHz. Its loudspeaker accepts an external signal either directly or via its own built-in power amplifier (when power is applied). Basically the 43BB consists of an IEC 60318-4 Ear Simulator and a 40HT Low-noise Microphone System. The built-in microphone is the 40AH Low-noise Ext. Polarized Pressure Microphone that has a specially reduced noise floor in order to achieve a large dynamic range. Below 10 kHz, the frequency response is identical to that of a standard IEC 60318-4 ear simulator. Above 10 kHz, the differences in the microphone diaphragm impedance results in substantial differences. The standard ear simulator has a high-Q resonance around 13.5 kHz related to the length of the ear canal and the diaphragm impedance. In the low noise version of the ear simulator the single high-Q resonance is replaced by two resonances. Part of the design of the low noise microphone is a filter unit that controls the mechanical resonance of the low noise microphone. The combination of the filter and the low damping of the diaphragm cancels out the high peak of the resonance in the simulator. The preamplifier is the 26HG which is similar to the GRAS 26AC ¼” Standard Preamplifier, but with a 40 GΩ input impedance to enable low-level noise measurements. It has an integrated lightweight cable terminated in a 7-pin LEMO connector that plugs into the 26HT Gain and Filter Unit. To complete the system, a special power module is part of the delivery, i.e. the12HF 1-Channel Power Module for Low-noise Systems. Read more about the 43BB Low-noise Ear Simulator System. Compared to the standardized pinna, the anthropometric pinna embodies a number of improvements to the concha and ear canal, combined with increased collapsability of the helix, and improved mounting. It is made of soft silicone, 35 Shore OO hardness. The external shape of the pinna is identical to that of the standardized KEMAR pinna, but concha and ear canal have been modified so that they closely mimic the properties of a real human ear. The ear canal has been extended and is now an integral part of the pinna, which seals directly against the ear simulator. Like the human ear, the ear canal has the 1st and 2nd bend, and the interface with the concha is oval. Fit and insertion consistency are much improved over the cylindrically or conically shaped ear canal extensions that are used with the standard pinna. The flexibility of the outer ear has been improved, and when mounting supra-aural and circum-aural headphones the pinna now collapses against the head very much like a human ear. In addition to the traditional push mounting from the outside, the pinna is secured with two screws from the inside of KEMAR's head. These two screws ensure that the pinna is held firmly in place. Therefore, it seals perfectly against the ear simulator and the head, and it is therefore possible to mount and dismount DUTs repeatedly without compromising the seal. Read more about the Anthropometric Pinnae. 45BC-12 is configured to meet the consumer electronics industry's need for R&D testing of headsets, including sets with Active Noise Cancellation. The anatomical shape of the pinnae makes it possible to achieve excellent fit and sealing with anatomically shaped in-ear transducers. Controlling the insertion depth is easy, leading to good insertion consistency and highly improved repeatability and accuracy of measurements. The improved fit and seal also means that the low frequency response is improved. It will allow you to reproduce bass notes, as well as effectively measure (active & passive) attenuation. Because it can measure down to and below the threshold of human hearing, it can measure the influence of the electronics on the audio response of the earphones. Its low noise floor and usability above 10 kHz means that measurement results will have a strong correlation with the subjective feedback from test persons and users. The low inherent noise of the system also means that THD and Rub & Buzz at very low levels can be investigated. 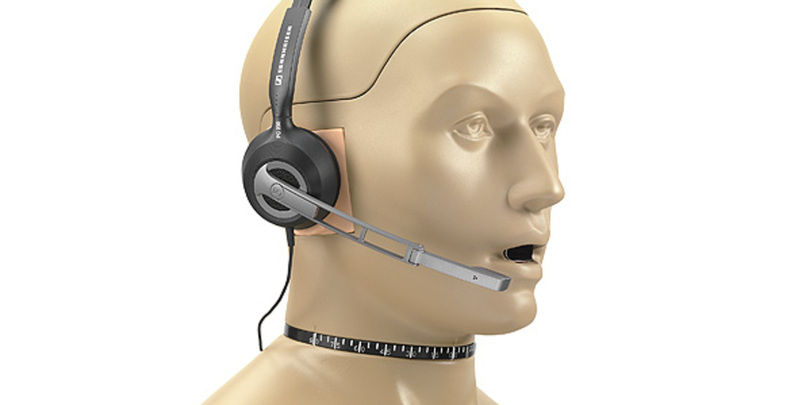 The improved collapsability of the pinna, and the built-in mouth simulator makes it well suited for testing of supra-aural and circumaural headsets.